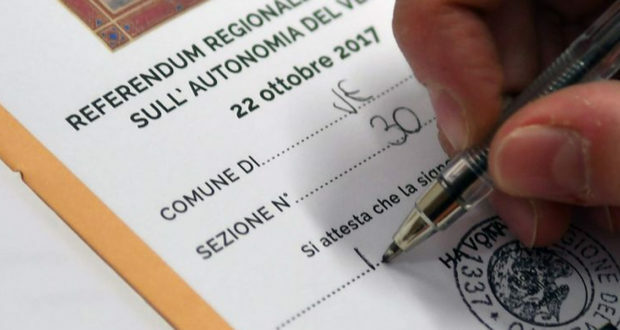 Two wealthy regions in northern Italy held referendums on Sunday as they seek increased autonomy from Rome. This move is reminiscent of the push for independence by the Catalans in Spain and the Kurds in Iraq. Unlike the referendum in Spain, this vote was legal. Five regions in Italy already enjoy special autonomous status under the Italian constitution, and now Lombardy and Veneto want to join them. Together, these two regions encompass Milan and Venice, account for a quarter of Italy’s population, and make up about 30% of the nation’s GDP. Voter turnout was nearly 60% in Lombardy, where 95% of voters supported greater autonomy. Turnout was just under 40% in Veneto, with 98% of voters choosing increased autonomy. Those who support the referendums believe the successful economies of Veneto and Lombardy should not be forced to fund poorer regions in the south of Italy. Sunday’s referendums are non-binding, but the results could give Lombardy and Veneto the leverage they need to seek a larger share of tax revenue and increased control over infrastructure, education, health, and immigration. President Luca Zaia of Veneto and President Roberto Maroni of Lombardy are both members of the far-right Northern League – an anti-Europe, anti-immigration party that once favored secession from Italy. “What has won is the idea that we should be in charge of our own backyard,” adds Zaia. Sunday’s results bode well for the Northern League as it attempts to increase its share of the vote ahead of the national elections to be held next May. Italian Prime Minister Paolo Gentiloni says he is ready to begin negotiations with both regions. European Parliament chief Antonio Tajani says Europe should “fear” the proliferation of small nations. A fractured Europe would indeed be harder to force into the EU’s idea of what the world should be like, but these regions deserve a voice. If these referendums become a trend, Europe will be psychologically predisposed to support autonomous regions in the rest of the world. In cases like Kurdistan, it could lead to freer peoples. But it will also make the world a less stable place. Wars are inevitable, and economies of scale might be more difficult with smaller areas. Perhaps the most attractive feature of this phenomenon is that it will help to preserve the diversity of cultures in the world, something that is fast disappearing as globalization takes hold. Editor’s note: If this really becomes a trend in Europe, it will likely become a trend worldwide. And, of course, since Europe is doing it, they will be forced to support these efforts around the world.